A curtain of garments runs around the edge of the store, lining the display area which is dematerialized by shafts of light from the floors. 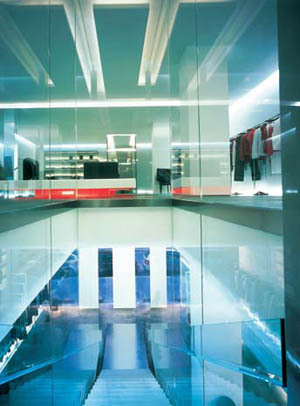 Pierre Huyghe’s elongated interior space is both art installation and a changing room. The mutual attraction between fashion and architecture that is being presented as a very recent development really began in the 1970s, when fashion designers started to look beyond the conventional restrictions of marketing and to hire architects to work on the image of their stores. The collaboration between Shiro Kuramata and Issey Miyake is a good example. At the other end of the market, Esprit worked with Sottsass, Citterio, Foster and others. Today Prada has Rem Koolhaas as its architectural guru, and Miyake continues to work with architects, including Frank Gehry. In the centre stands Pierre Charpin’s platform with black leather backrests, hovering above a circle of red light, above. But the balance between the two sides is unstable. While the world of architecture is only just beginning to react to Koolhaas’s shopping theories, the fast-moving fashion system already seems to have shot past and taken over, to judge by the new Dior store in Milan. It’s not an architect trying to make a fashion store, but rather a fashion designer moving into architecture and bringing art with him. The star system has the fashion designer at its centre. And it depends on no dilution of the designer’s – or rather the brand’s – aesthetic vision. 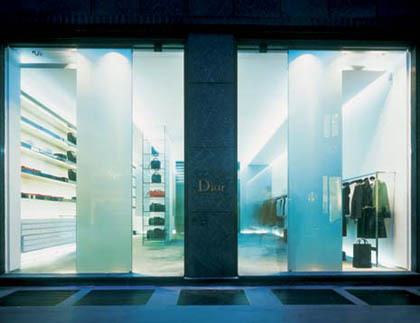 Hedi Slimane, Dior’s artistic director, was responsible for the architecture as well as the overall image of the company’s first men’s shop, in Milan. Since it entered the orbit of Bernard Arnault, head of the LVMH group, Dior has relied on Hedi Slimane to run its menswear operation. Slimane is in the middle of a titanic clash between LVMH and Gucci (which controls Yves Saint Laurent); indeed, the press has tried to depict him as some kind of anti-Tom Ford. Whereas one is the picture of health and the dispenser of luxury, the other is leaner and quieter, more inclined to spend his time under a leaden Berlin sky than in the bright sunlight of a Caribbean island. Slimane’s position was made official with the presentation of his first menswear collection. All the corporate top brass was in the front row. Karl Lagerfeld and Bernard Arnault sat next to each other. And the occasion was made all the more resonant when Yves Saint Laurent was conspicuously absent from the simultaneous parade of clone-models that Ford staged in his honour for the house that still bears his name. Slimane’s first act as art director of the Dior Homme collections (with control over its corporate image and hence also over the architecture of its boutiques) was to design the Paris space in which the line would be created. The perception of space is lost in the reflections of light on the surfaces of the long mirror wall and the glass that frames the staircase, right. 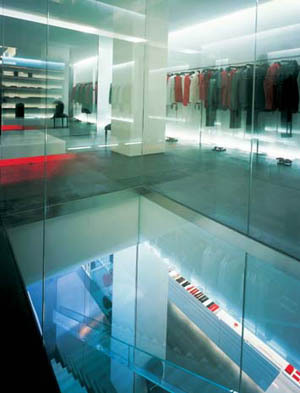 The atelier would become the model for the stores that would diffuse the Dior Homme brand throughout the world. With a minimum of immaculately crafted details, a certain futuristic Aura is suggested by the slices of light that give the space an immaterial impression. Despite the air of modernity that Slimane is striving for, the mood in the rue Francois 1er salon is rooted in the atelier’s classical tradition. Dior himself had seen it as the point of departure for his distinctive version of contemporary elegance. And the pearl-grey moquette and Louis XIV chairs with the Dior medallion on the back are reminders of the kind of couture house of which Dior is the most classic expression. Pierre Huyghe’s art work in the midst of Slimane’s design raises the difficult issue of the relationship between culture and commerce. The Dior Homme boutique in Milan, while maintaining this spirit and repeating the allusions, goes farther in its blending of culture and commerce. Each new ‘space of diffusion’ for the Dior Homme collections – as the fashion house prefers to call its boutiques – is associated with the work of an artist. 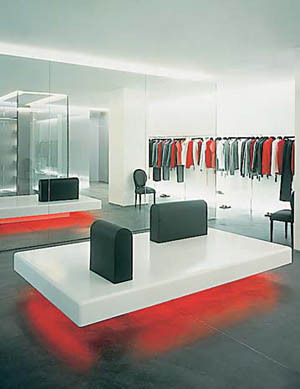 Pierre Huyghe, who represented France at the last Venice Biennale and is currently exhibiting at Documenta11 in Kassel, has designed, within a defined architectural volume in the Milan store, a space intended to serve as a changing room on the sales floor. The booth is a secluded, intimate space. On entering, the customer is naturally encouraged to walk straight to the end wall, almost hitting his own image reflected in a mirror. It is as if he had suddenly bumped into a twin he hadn’t seen since birth. Running the length of the booth is a luminous shadow that moves along the wall with the customer. The narrow and elongated space suggests walking right to the other end: movement causes the wall of LEDs to react, and its surface duplicates in light the visitor’s gestures. In fact, the body unconsciously intersects various beams of light as it moves along the booth.